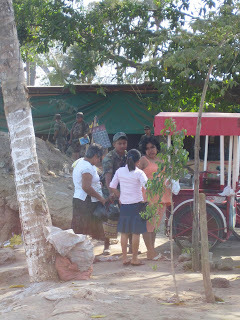 TAPACHULA, Chiapas-I got a taste of the power struggle between Mexican soldiers and Grupo Beta officials when we went down to the river to check out the Chiapas/Guatemalan border river. We were about to leave when a soldier- who couldn't have been more than 19 years old-stopped me. He demanded to see the last picture I had taken, claiming that I was not allowed to take any photos of soldiers. Keep in mind these are probably the same soldiers that terrorize Central American migrants when they cross into Mexico. Before I could even react, the head of Grupo Beta who we were riding with, came to my rescue. He jumped in front of me and told the soldier that I was with the press, and I didn't have to show him anything. Grupo Beta is the only organization that can report soldiers for wrongdoings against migrants. The teenage soldier told us that we had to see the photos because of anti-terrorism efforts. Apparently, the soldier-in-charge saw the confrontation, walked over to us and sent the other soldier away. He apologized profusely, knowing that Grupo Beta has more authority than them in that case. Who knows what other underlying power issues were going on between the two groups, but all I know is that I kept my camera. Later as I was reviewing my pictures I realized that during the course of our visit I had taken a photo of that soldier. Lesson: Download photos as quickly as possible, in case camera gets confiscated. Here the soldier is checking everyone's bags as they cross into Mexico.